I’m still planning on a January 5 release for A Very Tall Summer. All that’s left is for for my beta reader to finish, and then give me her comments/suggestions. That would be my wife Angela. I completely trust and value her opinion. Baring any oversights or plot threads I’ve failed to connect (entirely possible), it should be good to go. Ange is a careful reader, and she catches all my glaring errors and mishandled sentences. She intentionally did not read any of the excerpts I’ve posted because she wanted to approach it fresh, without any preconceptions. She’s also an amazing writer, so she knows what’s what. 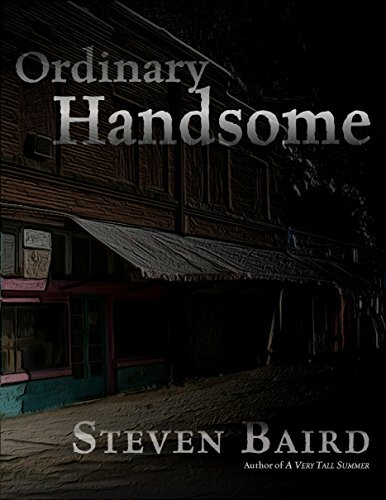 She knew about Ordinary Handsome, of course, because it was such an important project for me… twenty-plus years in the making. This one, though, came out of nowhere and I grabbed it before it could escape. I am releasing this book, not dropping it. That’s a word I’ve come to dislike in that context. An artist should not drop their work, whether they be novelists, poets, singers, actors, etc. The use of that word, to me, sounds lazy and irreverent. Releasing one’s work is a monumental thing. It’s both frightening and amazing. If the work was done with passion and curiosity, then it’s best to let it fly. Dropping it? Whatev. And so I am not dropping this like a pad of butter on the floor. I’m releasing this caged animal of mine into an unsuspecting world. It might be a rabid skunk, or it may be something that will fly, I don’t know. But I did my best, and I’m proud of it. Pardon the rant. I guess I’m slowly turning into a get-off-my-lawn-you-whippersnappers kind of guy. Thanks to all who have patiently — and dare I say, enthusiastically — read the excerpts, liked them, and commented. Positive feedback for a writer is pure gold. So thanks so much. Good luck with the new release, Steven, and let me know if there’s anything I can do to help it fly free 🙂 Happy New Year to you!